Lightweight and literally a snap to set up, the 35x35x35" Giant Digital Light Shed from Impact is a shooting enclosure that will give you clean detailed photos while others are still grappling with seamless paper and reflectors. Impact makes it easy in several ways. 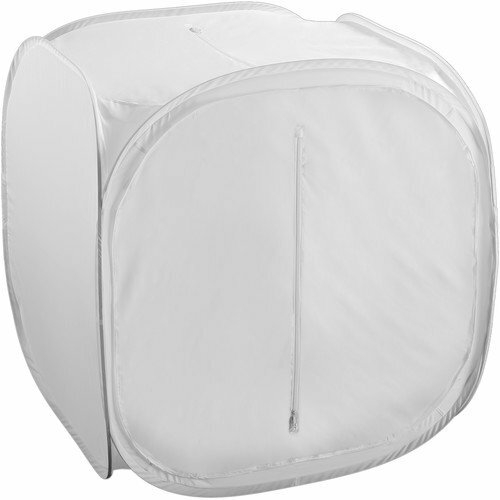 The white translucent cube has a removable front panel that facilitates positioning of the item to be photographed inside, which is then closed and sealed via touch-fasteners. Long front and top zippered openings offer a wide range of camera angles, and since all sides are translucent, 360 degree lighting is possible with your choice tungsten, LED, or fluorescent fixtures. You can even light a propped-up shed from underneath for a floating effect. Impact provides both white and black fabric sweeps that attach with touch fasteners for even more creative options. When finished shooting, simply collapse the panels upon themselves and twist as instructed into a disc that's about 1/3 its open size. A soft case is provided for storage and transport.